Text and photographs by, and copyright of, the Author unless otherwise stated. The Editor recently wrote about the die-cast model of the US Postal Service Delivery Truck. 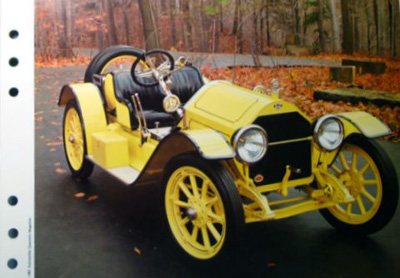 ‘Auto 100′ the Postage Stamp Car Collection is a valuable addition to any scale die-cast model car collection and can serve as an essential list of manufacturers and models of the available die-cast model cars produced. 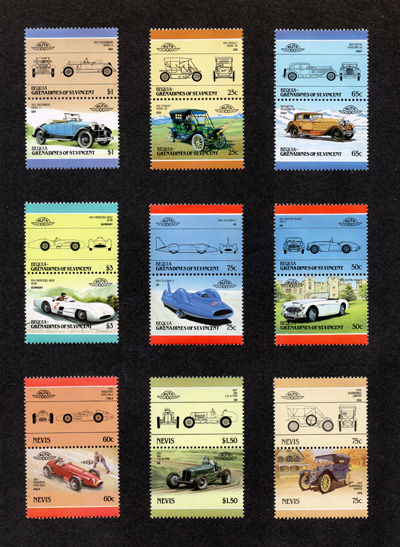 To celebrate the 100th Anniversary of the Automobile, a group of six English-speaking nations (Grenada, Nevis,Saint Lucia, Saint Vincent, Bequia & Union Island, and Tuvalu) assembled a collection of official postage stamps featuring cars. 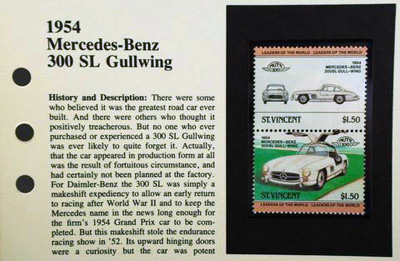 This collection is the most comprehensive collection of car stamps ever issued. 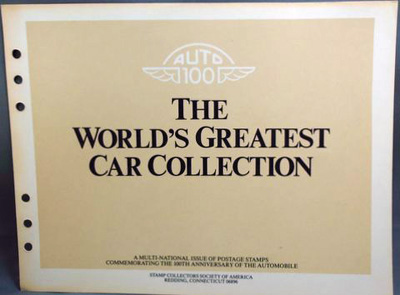 It commemorates the most important and historic road and race cars ever built, the designers, the racers, and manufacturers from around the world, an was entitled ‘The World’s Greatest Car Collection’. 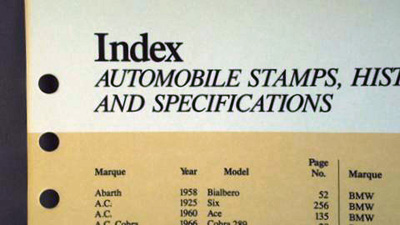 Introduced in 1984 by Stamp Collectors Society of America this collection includes 694 stamps, 61 full-page, full-colour photographs, 60 ‘profiles’ of drivers, designers and manufacturers, a history of the automobile, and a detailed description and specification of every car on the stamps, along with seven pages of Index and six pages of preface, introduction, and history of every car. 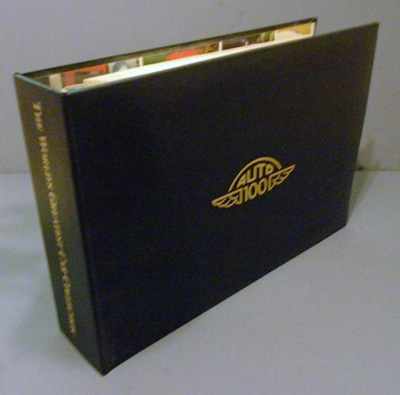 All 306 pages are stored in a loose leaf, six-ring, black and gold decorated album, provided exclusively to subscribers. The total value of the complete collection, as detailed above, was $563.00 in the 1980s. 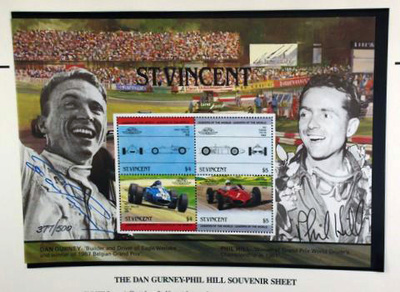 The car stamps were available from the Stamp Collectors Society of America until their discontinuation in 1990 and are still available in sets of eight to sixteen stamps or in collections of 130 stamps or less from eBay. Each month the subscribers to the original collection received 24 Stamps, one or two photographs, and one or two profiles with an invoice for $19.50 and with a “Stamp Collectors Society of America” letter announcing the next set of 24 stamps. 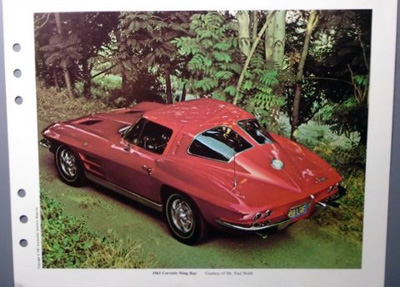 Each shipment featured additional information about cars, designers,racers, manufacturers, etc. The accompanying letter was addressed to the subscriber and signed by Prescott V. Kelly, President of Stamp Collectors Society of America.